Has your passport seen better days? If your valid passport is in poor condition because of heavy wear, water damage, or other mishaps, it is time to get it replaced. 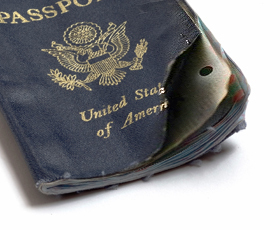 Severely damaged or mutilated passports are not valid for travel or for use as identification. Even if your passport is just heavily worn, it could be cause for you to be denied entry to a country or not to be allowed to board a plane. Read on for our complete guide on how to replace a damaged passport, including all requirements for damaged passport replacement and how to replace a damaged passport fast. Expedite Damaged Passport Replacement in 24 Hours! 1 Gather all documents required to apply for a damaged passport replacement. Proof of US Citizenship – This can be either a birth certificate (must be an original or certified copy) or an expired passport. Please note that if your appearance has changed significantly, an expired passport may not be accepted as proof of citizenship. A letter addressed to “US Department of State” that explains how your passport came to be damaged. This letter must have your original signature in blue or black ink. Damaged passport replacement fee – You will need two checks, one made payable to “US Department of State” for $110 ($170 if you need expedited service for passport replacement) and a second check for $25 for the Passport Acceptance Agent fee. Your next step is to go in person to a Passport Acceptance Agent. The agent will review your damaged passport replacement application and then will seal it into an official envelope. Passport Acceptance Agents are usually located at main branch US Post Offices and at Clerk of the Court offices. You can find a nearby location at //passportinfo.com/passport-offices/. Some agents require that you call ahead to make an appointment. By Mail – The Passport Acceptance Agent can mail the sealed envelope with your passport replacement application to be processed at the National Passport Center. At a Passport Agency – You can make an appointment to go in person to one of the 26 Passport Agencies located in major US cities for faster service than is available by mail. By a Passport Expediting Company – Passport expediting companies offer a fast and convenient way to have your damaged passport replaced. Your passport replacement can be processed in as little as 24 hours through a reputable passport expediting company. Applications for damaged passport replacement that are sent in by mail can take up to 8 weeks to be completed. You can apply for expedited service for passport replacement by mail for an extra $60 government fee, and have your new passport back in your hands in 2-3 weeks. Much faster service is available by going in person to a Passport Agency or using a passport expediting company. If you want to apply in person at a Passport Agency, you will need to have proof of urgent travel and you must make an appointment by calling the National Passport Information Center at 877-487-2778. We recommend using a passport expediting company if you need to have your damaged passport replaced fast. Using a passport expediting company will save you the time of having to make an appointment, travel to a downtown location, and wait at a government office for hours. Even better, you will have the advantage of having passport experts to guide you every step of the way, including helping you figure out if your passport is badly damaged enough to require the procedure listed here or if you can apply for an early passport renewal instead.